"SWAHA performs a unique blend of ancient Sanskrit prayers and modern Western music." "SWAHA's richly textured, transcendental vocals and beautiful melodies make each song a delight!" I attended your kirtan for the first time on Saturday night. I brought with me a few friends and all of us just LOVED your music. It was inspirational and powerful and we were left full of peace and joy. Thank you for sharing your gifts with the rest of us. I feel so blessed to have you both in my life. I would like to attend any future kirtans and hope to bring more of my friends! 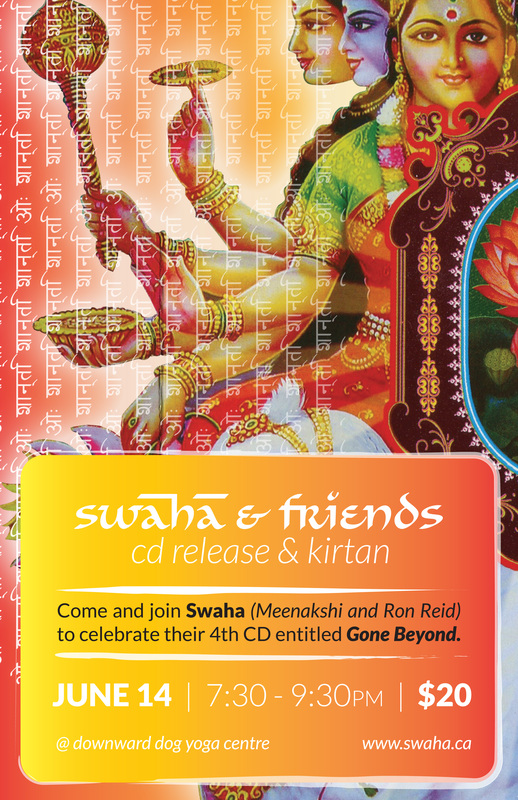 Swaha (Ron & Marla) are excited to release their 4th CD! Come groove with them as they share their newest songs with their stellar band! Featuring: Chris Gartner, Kevan Mackenzie, Stew Crookes, Carlos Lopes, and Lana Sugarman.. This CD release is a "Pre-Bhakti Fest" event, as Swaha will be part of the Fest in Wisconsin the following weekend. Ron and Marla in Europe and Asia this fall! We are so excited to be visiting 5 different countries.